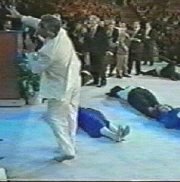 Benny Hinn: Faith Healing or Mesmerism? You believe that evangelist Benny Hinn is anointed of God? In reality, he uses mesmerism! That’s a shock for some of you, I know, but I’ll prove it to you. This technique was formulated by Franz Anton Mesmer, a physician and healer who achieved remarkable cures comparable to cases presented in today’s Miracle Crusades, although – remember this – Mesmer never used God’s name in his practice. This German physician successfully developed a method to relieve the pain of his patients, believing in an invisible, curative fluid pervading the universe that could influence the human body. Some kind of an “anointing” if you will that acts on the mind of the person. This was the foundation of hypnotism. Therefore, he spent a great deal of effort in trying to master that “invisible fluid.” He developed the method, which is defined as follows: The capacity of raising the emotional state of an individual, or a crowd, to an abnormal, but controllable intensity. How is this accomplished? Mainly through music. Yes, emotional, repetitive music plays a role in the control of the mind and nervous system of the followers. The verb to mesmerize means: to hypnotize, to spellbind. It entered the language of the West as a synonym for “to throw into a trance” because the subjects would fall into a state of semi-consciousness. The technique is now being used in religious circles but disguised in different terms. You compare these two men above and you take a serious look at the healing testimonies presented by this televangelist. First, nothing comes close to those cases found in the Bible. Moreover, his power to heal the sick does not exceed that of the mesmerists of old or other faith healers who practice under a label other than Christianity. He appeals to many because he’s more entertaining than others but is his anointing from God? More of my observations are listed below. FRANZ MESMER put together ideas like suggestion and auto-suggestion in a scientific, systematic method, then popularized his concept for anyone to use. Considered the early pioneer of modern hypnotism, he performed his healing practice in the same manner faith healers operate their ministries today, achieving similar results perhaps even more extraordinary. Though this method has its benefits, please keep in mind that it is far from being inoffensive and harmless. Once people are mesmerized, they can no longer analyze. He also exercised the laying on of hands. In his view, cures were induced through “magnetic passes” of the operator’s hands. Yes, the pain would go away and people believed they were cured. At times he would point at a patient standing many feet away from him; the next instant, the patient’s body would lie on the floor in convulsions. He also had a peculiar ability to throw his subjects into a state between sleep and wakefulness, and became a master of it. 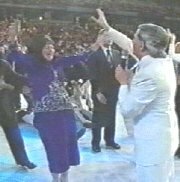 BENNY HINN emulates his idol Kathryn Kuhlman. The only difference I’ve been able to observe is that Miss Kuhlman wore a white dress and he wears a white suit. He claims his anointing comes from God. Isn’t strange that he cannot produce biblical healings? In over 25 years of ministry there’s never been one single leper cured, or a person raised from the dead! His theatrics and emotional crusades take pain away leading his admirers to believe they’re healed. From what? asthma, arthritis, multiple sclerosis, fibromyalgia, blood and heart conditions, etc. How about the paraplegics, those who’ve suffered terrible burns or have been left crippled after a serious stroke? They don’t get healed. Do they all lack faith? Wouldn’t you agree that his “anointing” is selective and quite limited? He regularly uses his staff members to set the example for those unfamiliar with the “slaying in the spirit” phenomenon. They all fall down giving the impression that an anointing emanates from his hands. I have video clips showing individuals stretching their arm out to break the fall or bending their knees because the men behind them failed to catch them in the usual manner. Isn’t strange? I have seen his wife Suzanne pull her jacket back down over her stomach as she “fell in the spirit.” If she had been “slain in the spirit” would she have cared about her appearance? MESMER was renowned for his musical knowledge and refined playing. In his séances, he used an elaborate arrangement of music, lights, and other paraphernalia as stage properties to set the mood and relax his patients. He was also convinced that it intensified the communication of this “universal fluid” – the famous anointing, so he profusely used it. Under his commands, musicians shifted from stormy to soft music to induce the mesmeric state through the music’s sharp penetrative tones and vibrations. And people walked out thinking they were healed! HINN has learned his routine from Miss Kuhlman. Very often during the course of the service, he will order his official organist to change the tempo of the music, and to quickly flow with him in the same spirit! His performance includes melodious whispers and fearful shouts. And he has some angelic music played whenever he prays to give a feeling of divine atmosphere. He puts on, we have to admit, a very entertaining performance. Once he confessed to a Canadian reporter that he’s an artist, that he’s always been an artist…and that’s how you should consider him. MESMER and his disciples achieved remarkable cures of functional disorders. Thousands believed that such treatments were responsible for the recovery from back troubles, arthritis, paralysis, liver or stomach problems, epilepsy, stuttering, and even blindness. Followers also reported prickly sensations or tingling going through them as the operator exercised the ritual. These phenomena also occur in today’s crusades. HINN often tells his followers that they can lose their miracle. For instance, he recommends that they should read verses and confess their healing to remain “healed.” If they get sick again, well…it’s not his fault. I suggest to you that they’ve never been healed in the first place. When God heals, He heals instantly, completely, and permanently. I believe in miracles. I also believe that God acts regardless of the environment and He hears the cry of His children. But while some want to give God the glory when blessed, Benny Hinn walks away with the credit when a person gets better.